The Joby GorillaPod 3K Pro is a pro&dash;grade metal version of the bestselling GorillaPod 3K model. This new series is designed for vloggers and content creators looking for a versatile, durable and reliable support for their mirrorless cameras. The Metal Revolution continues with a full line up of GorillaPod products for both mirrorless and DSLR camera users. • The bestselling GorillaPod 3K series evolves in pro&dash;grade metal form. • Designed for the latest premium mirrorless camera users. • Featuring the new BallHead 3K PRO with Arca Swiss compatibility. Petaluma, California, April 8, 2019 - JOBY, creator of award-winning mounts, stands and grips designed to elevate the potential of the latest mobile and imaging devices, expands its GorillaPod range with the metal version of the bestselling GorillaPod 3K model. JOBY transformed the camera accessories market over ten years ago with its GorillaPod flexible tripod and continues to innovate with an ever-evolving collection of supports designed for the next generation of storytellers. With a strong following comprised largely of millennial and Gen Z consumers, JOBY is at the forefront of the new wave of content creation and continues to introduce innovative solutions that continually break the mould to provide customers empowering functionality and fun experiences. The timing of the GorillaPod 3K PRO series aligns with a higher consumer demand for lightweight pro level camera supports. This new series is designed for vloggers and content creators looking for a versatile, durable and reliable support that will help them create high quality content with their lighter weight premium mirrorless cameras. With this new series, JOBY content creators will be able to grip, wrap and stand their camera on any surface thanks to a new durable and reliable metal support. Small and lightweight, but sturdy enough to hold up to 3kg (6.6lbs) of camera equipment. 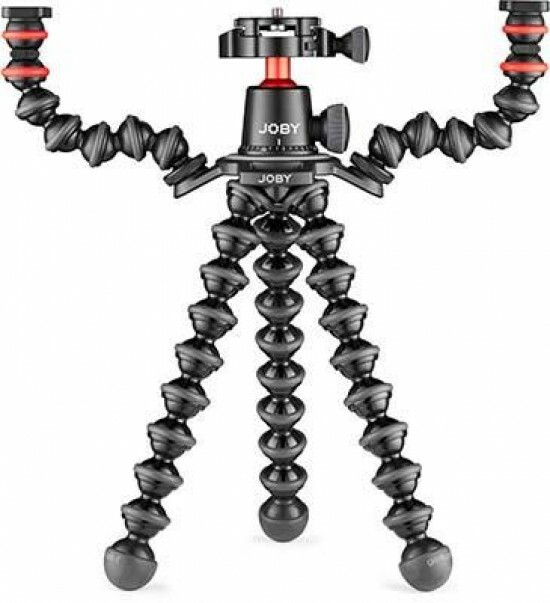 - The GorillaPod 3K PRO Kit combines the BallHead 3K PRO with the versatile GorillaPod 3K PRO Stand for groundbreaking content creation. - New aluminum BallHead 3K Pro with an Arca-Swiss compatible Quick Release plate that matches the smaller footprint of new mirrorless camera systems. This ball head allows 90-degree tilt and 360-degree pan movements. A secondary knob has been added to lock pan separately and a numbered scale on the base lets users accurately repeat 360-degree pans. The versatile ¼”-20 mount allows users to attach and stabilize cameras, strobes, flash, mics and any other hardware up to 3kg. - The GorillaPod 3K PRO Stand, made of more than twenty four high precision ball and socket joints, secures cameras to any surface, with or without the ball head, making it one of the most lightweight camera supports for versatile shooting angles. Made of anodized aluminum, the GorillaPod 3K PRO legs deliver great durability, security and smooth movements on any kind of terrain. - The GorillaPod 3K PRO Rig, made of the GorillaPod 3K PRO Kit together with the Hub Plate and the GorillaPod Arms. The modular and versatile construction of the GorillaPod allows the mounting of lights, mics, monitors and other accessories up to 3kg (6.6lbs), transforming it into the perfect choice for the ultimate vlogger experience. With the GorillaPod 3K PRO and 5K metal series, the Metal Revolution continues. The GorillaPod 3K PRO series is the perfect match for all vloggers looking for a lighter solution for their mirrorless cameras, while the GorillaPod 5K series remains the ultimate solution for pro video experience with camera equipment up to 5kg (11lbs). The GorillaPod 3K PRO series will be available towards the end of Q2 with the exact date to be confirmed.